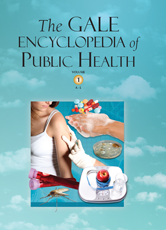 The Gale Encyclopedia of Public Health is an authoritative source on public health issues. Topics focus on health crises affecting the public at large, ranging from epidemic (local) and pandemic (widespread) diseases (H1N1, Malaria, food-borne illnesses, West Nile etc. ); chronic conditions such as famine, malnutrition, cancer and diabetes; and social issues such as sexual abuse, obesity, bullying and new substance abuse issues, plus much more.